Felicia talks with Lou Sipolt, Jackie Schmillen & Meteorologist Jason Parkin on Great Day Iowa about the Aerial in Iowa and the 2014 Aerial Expo. (Iowa Fly Girl) crossed paths with LaFlash, busy with burlesque. Then they hooked up with others like DeVille, like Sweet Lilly Pie and Lady May the Force, and next thing you know, it’s a community, all high-flying misfits. So was born a combo you won’t find anywhere else in the nation. Besides a night of Misift Cabaret, what La Flash calls “a variety show with an edge,” the Science Center will host three days of Aerial Expo. This will entail both workshops and performances, topped off Saturday night with a national competition. Aerial artists are coming from as far off as Los Angeles. "Unless you’re an astronaut or a witch, your best bet for defying gravity might be aerial acrobatics. It’s that thing you see in Cirque du Soleil when they dance on ribbons hung from the rafters. It’s not new — gymnasts started swinging from ceilings centuries ago — but only in the last decade or so have the less limber among us tried it for fun and fitness. A few dozen amateur aerialists will get a chance to demonstrate their new skills at the first-ever aerial expo and competition July 26 at the Science Center of Iowa." Felicia was featured on the cover of Juice Magazine in August of 2013 for the "Hot Issue" with student and aerialist Tristabel. 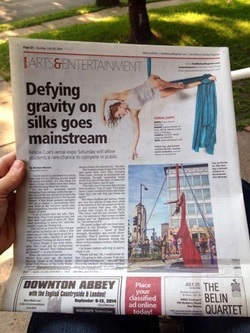 The story featured trends in Des Moines including aerial art. "If you’ve been to a big event this summer, you may have seen colorfully dressed individuals pulling off some crazy stunts" says magazine editor referencing aerialists including Felicia and a local acrobalance troupe. 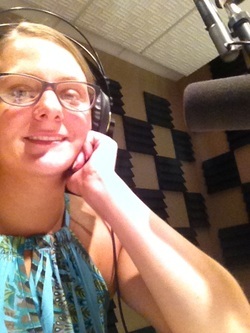 Felicia was featured as a model in six photos in the issue. All of which included and aerial element, including hanging from a lyra in a local distillery, posing with the band Hairball, and partner acrobalancing in a corn field. 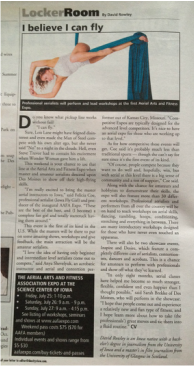 Felicia was featured on the front page of The Des Moines Register for her innovative aerial classes. "In short, aerial fitness is middle school rope climbing meets Cirque du Soleil. Coe, Iowa’s first and only aerial instructor, reunites students with their childhood dreams of floating through the air on a giant trapeze at the circus. More importantly, the exercises are challenging — lifting one’s body off the gym floor sounds easy but it is a test of core strength. Movements include stretching in an aerial hammock, climbing to the top of an 18-foot aerial silk, hoisting oneself up into an aerial hoop (lyra), and more." Felicia was featured in Juice's "What I'm Into" section for being Iowa's first and only Aerial instructor. "Why you should know her: Coe got hooked on aerial dance while living in Utah, and when she moved back to Des Moines she couldn’t find any classes, so she started teaching them herself. 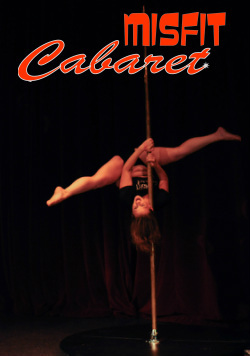 She has studied on aerial silks, lyra, trapeze and horizontal rails." The key to aerial gymnastics is: "Have fun! You don’t have to be strong, thin and bendy to start aerial. I start you out with the basics, which is on the ground, and we build from there and eventually get you flying. You will be amazed at how fast you build strength and how a trick gets a little easier each time you practice it. ... There is nothing better than the excitement you get when you finally nail a trick that you have been working so hard on." Felicia posing with the reporters after filming. Felicia was featured on WHO TV 13's weekly segment "Workout of the Week" for her original aerial fitness classes. Reporters Erin Kiernan and Sonya Heitshusen tried out Felicia's class and found out it was much more difficult than you might think, but also a ton of fun! "By the end, we’re exhausted but we’ve also accomplished more than we thought we could, and we had a blast doing it." The women behind People with Panache (PWP) came to Iowa and took some time to chat with Felicia about her aerial career and upcoming projects. 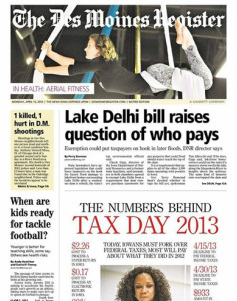 First, some basics: Felicia runs Des Moines’ first aerial fitness/aerial art business, and it just keeps growing. She’s been doing her aerial magic for four years now, but her greatest passion is teaching it. Felicia and her students use aerial silks (silky columns of loose fabric that hang from the ceiling) as well as similar, silky hammocks to move up and down and through the air, using their entire bodies for beautiful choreography—and having a blast. I talked with William at IGM about how you – yes you! – can help make Des Moines, Iowa, a national destination for the aerial arts. Even if the average reader isn’t interested in aerial, how does helping promote this event, help promote central Iowa as a whole? "I don’t think an event like this in Iowa would have been possible 10 years ago. The community here as grown so very much in the last few years. Local businesses are interested in supporting this expo, because it brings more people and more business to Des Moines and to them. Anytime you bring a event like this to the area is makes us more relevant nationally as a hot spot for the arts."